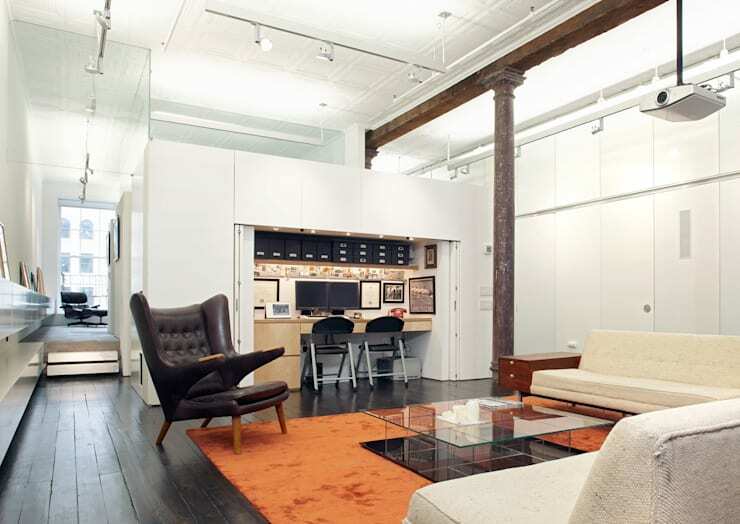 The existing space was a commercial/industrial loft space of about 3000 sf/300 m2. 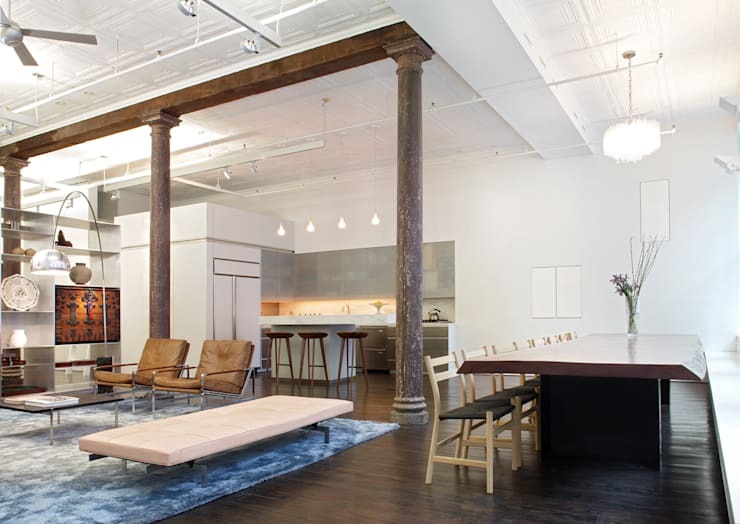 The historic front and back industrial windows define the large loft feel. In order to emphasize these and to allow light and views into the 100’ deep building, we kept the space very open front to back. Three 8 foot tall freestanding volumes arranged down the center of the existing space define the different program areas. The first volume is an aluminum bookcase we designed to hold the owner’s collection of traditional Korean trunks. The bookcase separates the living, dining and kitchen areas from the study. The side of the bookcase facing the living room is deep and is designed specifically to house the trunk collection. The side facing the study has more dense and shallow shelving for books. The second volume contains a built in desk area facing the study and a closet on the other side. Two hidden doors allow the corridor between this volume and the third volume (the walk in closet) to be closed off. The third volume contains the other side of the large walk-in closet and the master bathroom. The bedrooms and bathrooms are lifted on a rough stone platform about 16’ above the rest of the floor. The Master bedroom can be separated into two bedroom using a full height sliding wall. The freestanding volumes create two slots of spaces that run from the front of the building to the back. These provide a continuous view through the entire depth of the apartment and function as corridors linking the different areas of the apartment. The corridor/slot on the south side provides and informal passage between the living room/ study / master bedroom closet/ masterbath and masterbedroom. The length of this slot through the full depth of the building is emphasized by two continuous wall mounted lacquer boxes that function as display shelves and contain concealed storage drawers and concealed shelves. The north corridor is the public corridor connecting the dining, kitchen/ study and guest bedroom. The full height laminate wall on the north side of the apartment conceals the storage and utility area/ powder room/ guestbathroom / ac units and access to the egress stairs as well as a loft sleeping area. Two of the panels are create a large pivot door that closes of the bedroom area and provides access to the egress stair. Each panel of this wall is a different white laminate, all with different finishes and textures; glossy, matte, patterned, textured, metallic and plain white finishes. From a distance the wall looks like a continuous white surface. The subtle laminate textures and finishes reveal themselves as you approach. Hard to capture in photos but powerful when you are in the space. The Masterbath has a large convertible tub/shower. The his and hers shower has a teak slat floor that can be removed to reveal a large soaking bathtub. The powder room and guest bathroom are each treated as color studies. The powder room is an intense red glossy tile. The guest bathroom is tucked under the firestair. We used four different shades of green mosaic on each surface to accentuate the volumes created by the stair volume. The headboard in the master bedroom is a teak slat wall. 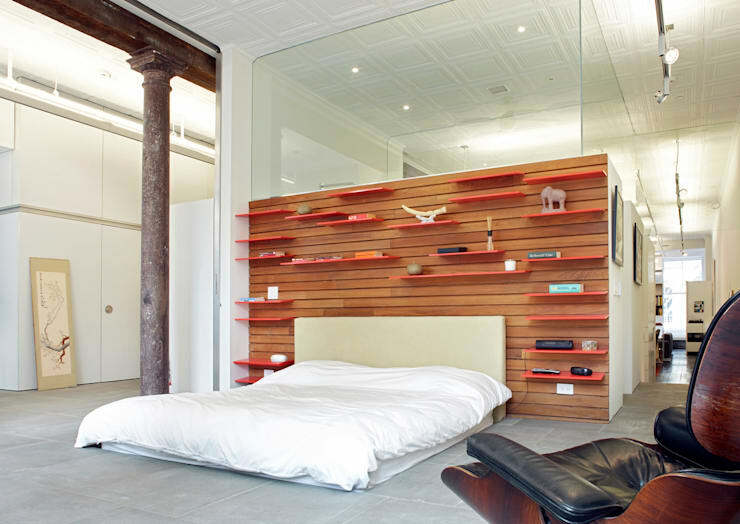 Bright orange lacquer shelves inserted into the slats can be rearranged by the owner as needed. 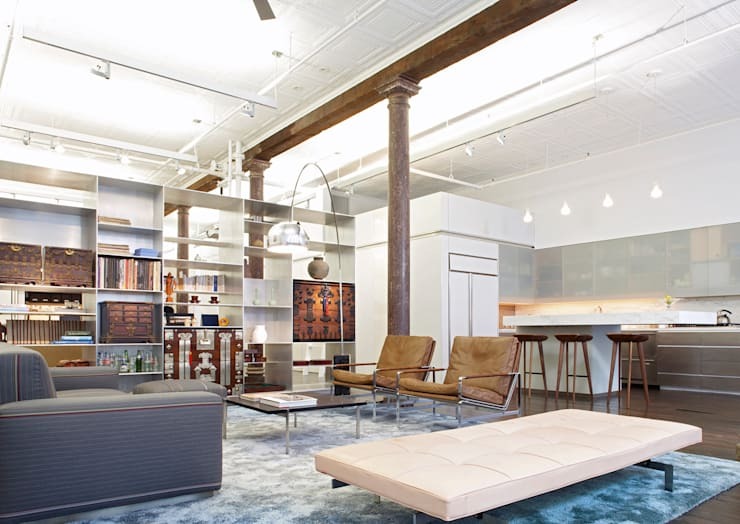 We selected all of the furniture and finishes. We designed a custom silk rug in the living room that fades from blue at the edges to silver in the center and a custom orange silk rug in the study. The custom table we designed out of a single, 19' long and 48” wide, slice of Mokore is the focal point for parties and entertaining. It seats about 20 people and runs the length of the east facing windows. The solid top was delivered with a crane and sits on two custom made blackened steel supports. 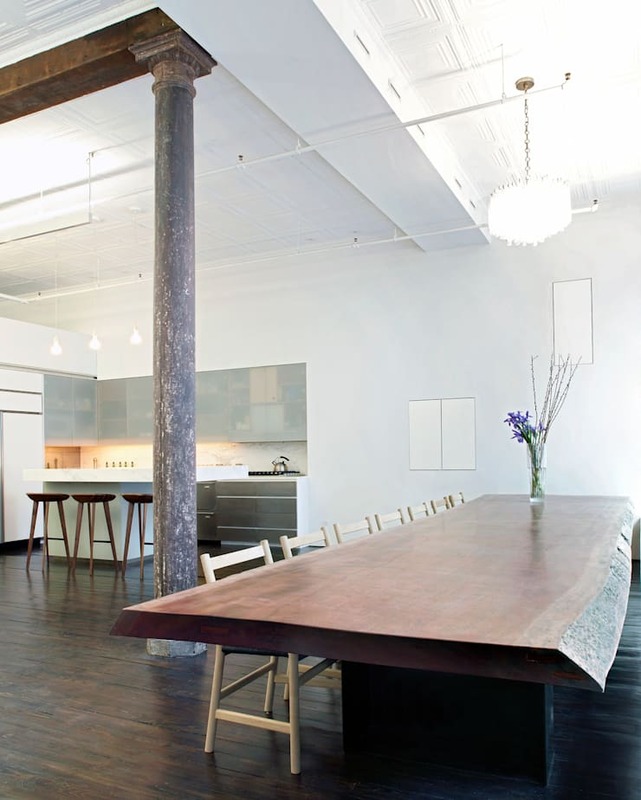 We kept the original industrial floor and stained it to provide a strong counterpoint to the new insertions. The upper cabinet doors in the kitchen are solid acrylic (Light blocks). The countertop is marble and matches the marble on the steps up to the bedroom. 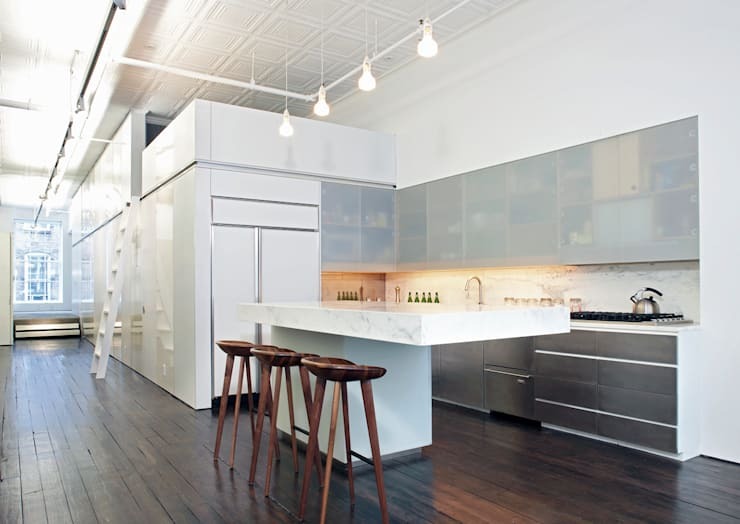 The lower cabinets are stainless steel. 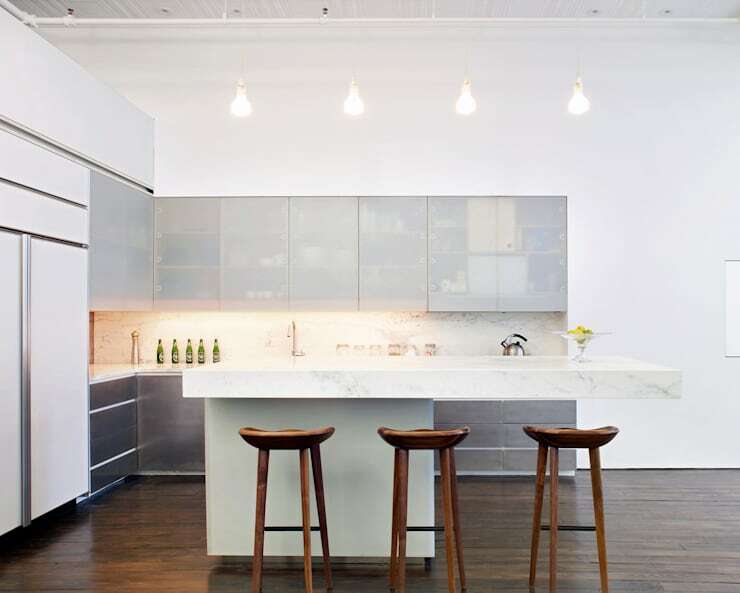 The kitchen island is clad in acrylic and the top is marble- supported by a concealed steel structure. ["CO"] [Published] 24 ideas para salas pequeñas y grandes, ¡para que te animes a decorar la tuya! ["VE"] ¡Atrévete a lo industrial! Te enseñamos cómo incorporar el estilo industrial a tus diseños. ["DE"] [Published] Einrichtungsfehler vermeiden—der Ratgeber für dich! ["RU"] [Published] Как использовать все преимущества высоких потолков? ["HK"] [Published] 10 iconic chairs to fall in love with! ["PT"] [Published] A mesas de cabeceira mais originais! ["PT"] [Published] 10 ideias para mesas-de-cabeceira! ["PT"] [Published] Camas de casal: que alternativas? ["VE"] [Published] ¡Construye un moderno podio en tu Cama! ["PT"] [Published] Mesas de cabeceira únicas e originais para o seu quarto! ["AR"] [Published] ¿En qué posición debo colocar la cama dentro del dormitorio?